﻿ Riad Dar Dmana Fes. JIMAT di Agoda.com! Menawarkan penginapan yang berkualiti tinggi di daerah siar-siar, budaya di Fes, Riad Dar Dmana merupakan pilihan popular untuk kedua-dua tujuan perniagaan dan percutian. Dari sini, tetamu boleh menikmati akses mudah kepada semua yang bandar meriah ini boleh tawarkan. Persekitaran yang terjaga dan kedudukan berhampiran dengan Dar Pacha Tazi, Batha, Massage Maroc memberi hotel ini daya tarikan istimewa. Ambil kesempatan daripada pelbagai perkhidmatan dan kemudahan yang tiada tandingan di hotel Fes ini. Ketika menginap di hartanah yang indah ini, para tetamu boleh menikmati meja penyambut tetamu 24-jam, kemudahan bagi tetamu kurang upaya, daftar masuk/daftar keluar ekspres, simpanan bagasi, parkir valet. Suasana Riad Dar Dmana terpancar di dalam setiap bilik tetamu. akses internet (wayarles), internet tanpa wayar (percuma), bilik tidak merokok, pendingin hawa, pemanas hanyalah sebahagian daripada kemudahan yang boleh didapati di hotel tersebut. Di samping itu, pihak hotel menawarkan aktiviti rekreasi untuk memastikan anda mempunyai perkara untuk dilakukan sepanjang penginapan anda. Riad Dar Dmana merupakan tempat yang ideal bagi penginapan pelancong yang mencari keindahan, keselesaan dan kemudahan di Fes. Nice Ryad close to the Medina in Fez. Big and comfortable rooms. Very quite. Staff were very kind and always opened to help with recommendations. Authentic Dar in a convenient location of the Median or Fes. It is unheated. I assume that thius is standard in Fes. However it was quite chilly at night. 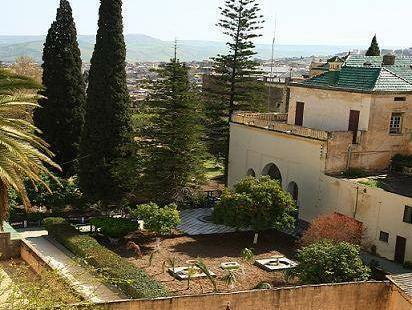 Riad dar Dmana had the authentic feel of a nobleman's house in Fes. This ws the kind of atmosphere that we were looking for and we were successful in finding it. The proprietor, Khalid, was knowledgeable and helpful in setting up excursions for us around Fes and the region. The breakfasts were enjoyable and the staff was quite froendly and acomodating. >Beautiful. As one enters the main courtyard, one is immediately introduced to the classic Morrocan architecture. The main courtyard is beautiful, and opens all the way to the covered ceiling. the stucco carvings on the vertical and horizontal posts,the medieval designed mosaic tiles on the walls have been painstakingly restored. The rooms on the 2nd, third and fourth floors are all located arround this courtyard. And overlooks this courtyard, as well. It is a classic old mansion. The antique doors and furniture pieces are something to marvel at. >Personalized Service. The owners and their siblings are the ones managing and serving themselves. >The food. The family appointed in charge of the kitchen is not really a cook! So what do you expect? Breakfast is the same everyday! 1 egg cooked either fried or scrambled! Butter, honey and orange jelly.! Overall, this Dar seems better than the others, as it is better located. It is in the higher end section of the old medina. And I commend the owners for the restoration job they have done! It is really beautiful. And even if there is no kitchen staff, at least the owner allowed us to cook our last night's simple meal of soft boiled egg and gave us bread to go with the eggs. They made sure that we had a good guide for the city and old medina tour. They even arranged for us to be picked up by the restaurant guide, to make sure we get there safely and surely. Good location and character of the riad. Smell in the room. No TV in the room. Our stay at Riad Rad Dmana was pleasant but the value for the money could be better. We were given a room that did not have a TV and had an unpleasant smell in the room. Other roomsin the riad were larger and had better amenities. The room was a bit small but comfortable. The location is excellent as it is just outside the medina.